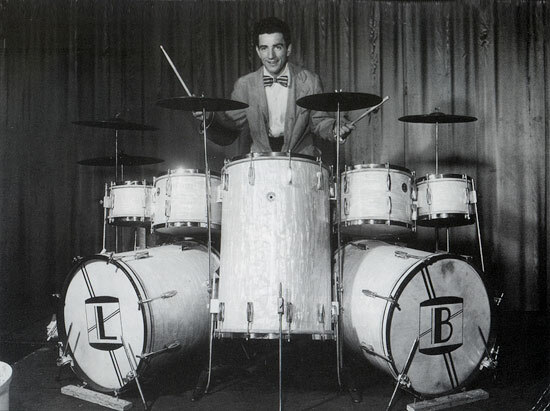 At age 15, Louie Bellson invented the double bass drum set-up. The double-bass, including conception (Bellson), first embodiment (Bellson w/Ted Fio Rito Band, early '40s), contemporary use (Ray McKinley) and eventual manufacture (Gretsch). 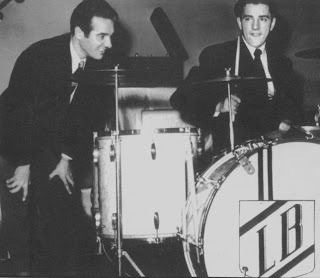 joined the Gretch Drum Company is that Benny Goodman had a contract with Gretch. All I had to do was tell Benny, “No, I’m [with] Slingerland.” But he – I was afraid he’d fire me if I said I don’t use Gretch drums, because they gave me about five or six sets of drums for nothing. So I cooled it until later on. Then I left Gretch and went with Slingerland. Brown: When did you actually have your first double-bass-drum kit? You already came up with the prototype in 1938. You had already started designing it. So when did you actually have one? FioRito. I had that when working with Ted FioRito for six months, before I joined Benny. That was an oddity. I took up half the bandstand with that kit. Brown: And it’s all your own design, especially with that large tom in the middle? That’s all your design? Bellson: I got rid of that drum eventually, because it made my leg span too great. My legs were sore by the time I finished the gig at night with that drum set. Brown: How did you negotiate working a bass drum and the pedal with your left foot? I mean the sock cymbal – the hi-hat cymbal. 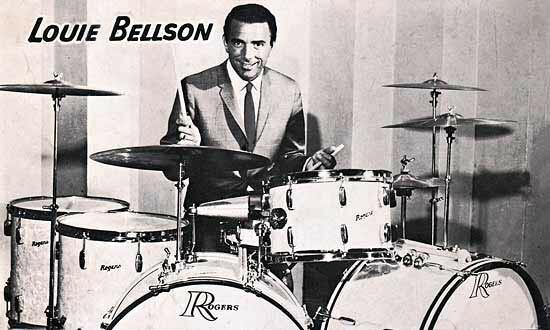 Bellson: I took the tripod off of the hi-hat and made a connection between the bell of the hi-hat and one of the rods in the bass drum, so that brought it right – this was the bass drum, and the hi-hat was right next to it, by getting rid of the tripod. Brown: So you had be an engineering designer as well. heel with the hihat, or both together. Brown: So you had to come up with your own technique and approach. Click image or here for full Smithsonian interview. 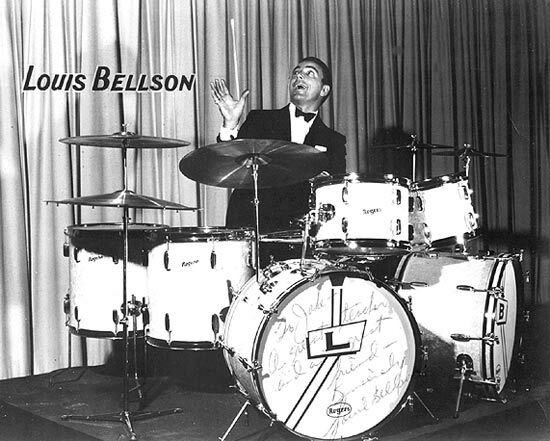 The kit that ... Gretsch team created with Louie in 1946 featured two 20x20 bass drums, in accordance with Louie’s original concept. But it went further than that. It also featured a unique combination of tom-toms. 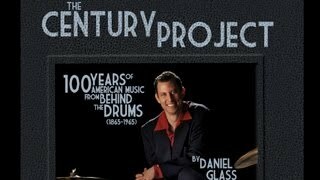 The center tom was a 26×18 floor tom placed directly in front of the snare drum. Symmetrically mounted on either side were 9×13 and 7×11 toms, with the whole assembly connected and supported on legs. The floor toms were 16×16 and 16×18. 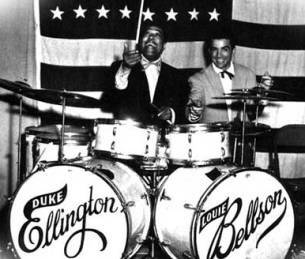 Louie Bellson with Duke Ellington. Click for full Gretsch Article. 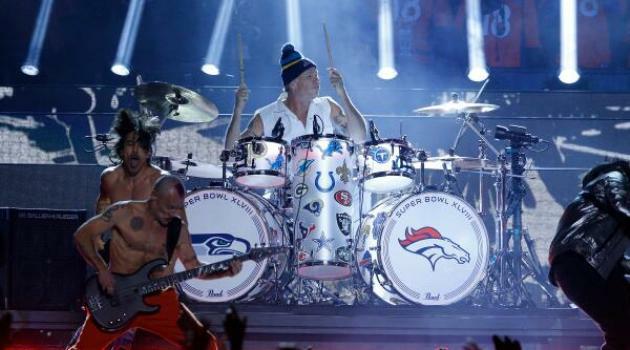 Here's the drumset played by Red Hot Chili Peppers' Chad Smith at Superbowl 2014. Q: Where'd they get the idea for this drumset from??? Hmm . .
Click arrow to go back to top of sidebar to select another page.